POTTERY AVENUE brings this FLOWERING SPLENDOR Baguette Platter in Polish Stoneware from “Boleslawiec” brings in a vintage vibe to your dining collection as it brings with it an element of exclusivity along with the timeless grace associated with the bygone era. Serve next to our Cracker-Olive tray. Dimensions: 18" x 6" x 1.5". POTTERY AVENUE brings this FLOWERING SPLENDOR medium size Baguette Platter in Polish Stoneware from “Boleslawiec” bringing in a vintage vibe to your dining collection as it brings with it an element of exclusivity along with the timeless grace associated with the bygone era. The expertise of “Boleslawiec” Polish artisans can be witnessed in the artistic brilliance of the sleek and long shape exhibited by the baguette platter. It features a subtle curve around the edges to grant an interesting oblong look to the rectangular design of this Polish Pottery. Enjoy this beautiful plate! It is great for holding all of your sandwich fixings, chips and dip (we’ve got the perfect bowls!) and more! Serve it next to our Cracker-Olive tray, and you’ll be amazed at how easy it will be to satisfy your guests. A national treasure, Boleslawiec ceramics have been manufactured for centuries. Developed from natural ceramic clay that can be found near Boleslawiec at the Bobr and Kwisa rivers. According to historical sources, the first stoneware was made in medieval times and in the early 16th century, local potters formed guilds to ensure perfection. Zaklady Ceramiczne "BOLESLAWIEC" was founded by one of the original men with the first pattern dating back to 1759. 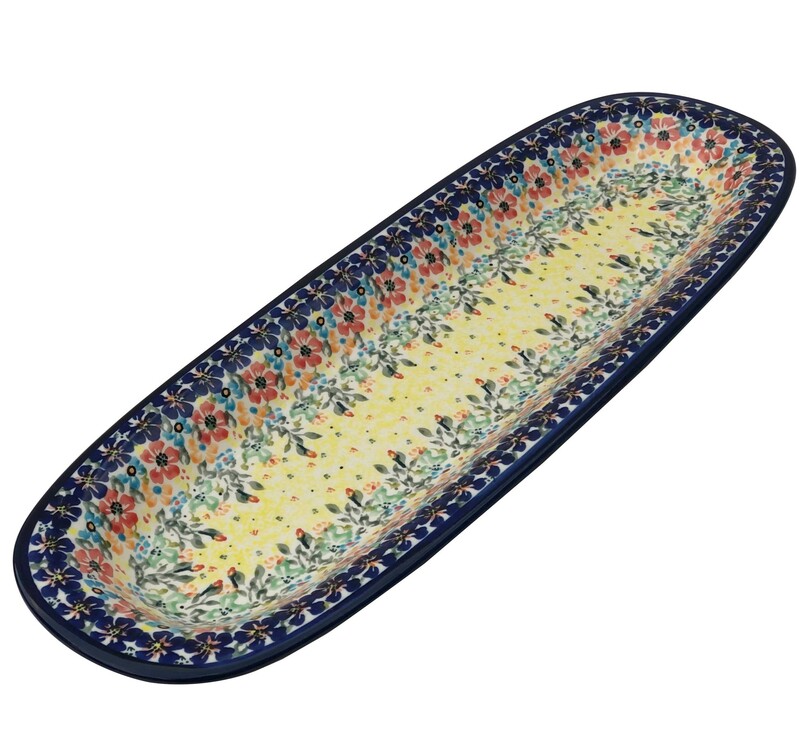 "FLOWERING SPLENDOR 18" BAGUETTE PLATTER“ is a UNIKAT pattern based of the 300 year old pattern "EYE OF THE PEACOCK". Designed by top designers and imported by Pottery Avenue, the premier importer of Polish Pottery & Polish Stoneware.